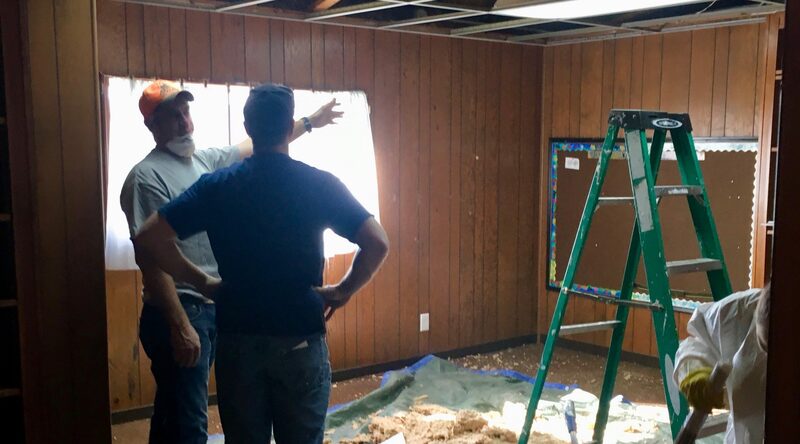 The OPC Hurricane Relief Ministry continues in Houston, 18 months after 2017’s Hurricane Harvey. An evangelist, Nick Lamme, was recently called to serve in the area and he is making new contacts with residents who need help. Hurricane Relief Site Coordinators are needed to oversee reconstruction projects. The qualified man will have experience in the skilled trades, and be able to provide leadership to volunteer teams working on a variety of tasks and sites. Serve as a liaison between the Regional Disaster Response Coordinator, the Volunteer Coordinator, the volunteers, and the homeowners. Understand and communicate the goals of the OPC Disaster Response Ministry. Oversee all aspects of indoor and outdoor projects being undertaken on a daily basis. Keep homeowners informed of the progress of the work on their homes. Welcome, orient, and oversee the work of volunteers. Determine the number of volunteers needed, the skills needed, and the dates they are needed for each particular project, and communicate this to the Volunteer Coordinator for recruitment. Report to the Regional Disaster Response Coordinator, giving regular updates on the status of each project, and requesting materials, funds or anything else needed for each project. The Site Coordinator will be reimbursed for his travel to and from the field. The Site Coordinator’s living expenses will be reimbursed while serving. The Site Coordinator is encouraged to bring his wife. The travel and living expenses of his wife will also be reimbursed. An additional allowance or stipend may be available. The Site Coordinator may be provided a truck for use in his labors. Inspection of property damage to assess how we may serve the family, yard and property debris cleanup, tear out and demolition of damaged walls, floors, cabinetry and the like, mold remediation, repair/replace electrical wiring and fixtures, repair/replace plumbing and fixtures, install moisture barrier systems, install new insulation and drywall, finish and paint drywall, install flooring, windows, interior and exterior doors, interior moldings, lighting, kitchen cabinetry and appliances, reconstruct built-in shelves and cabinetry, inspect and repair HVAC systems, dig exterior drainage ditches and install drain pipe, regrade exterior of property to improve drainage, repair/replace gutters and downspouts, roof repairs. Guide and counsel victims, as needed, in their choices of action, materials, design, etc.